Storytelling is a good training for kids. Kids learn so many things in the story telling process. They learn how to organize their thoughts; they learn the sequence of events and activities; they learn storytelling basics, such as beginning, middle and end; they learn to articulate an idea. It is a good activity for kids’ imagination. As parent, I always find something about my child I did not know. There are things kids don’t tell parents for various reasons, but they will tell through their stories. Thus storytelling tools is not just for school, not just a learning tool. It is also a parenting tool. I recently found a free website that provides free tools for kids to create stories. It is called Storyboard That. It also functions well on iPad. All have to do is to follow the instructions How to Add Website As An App on iPad Home Screen. Once you create an icon of the website on your iPad, you can use it as a regular app. I would not suggest using it on iPhone. It might work, but the screen is too small to maneuver the images. 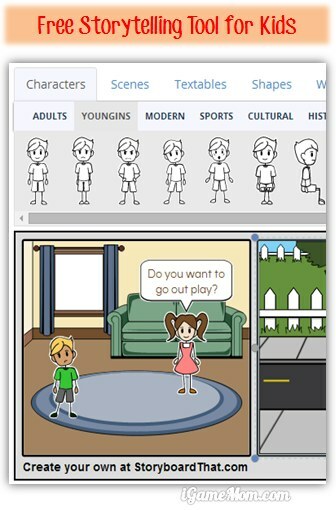 What Storyboard That offers is a platform for kids to create stories without drawing the pictures themselves. The site has pre-created characters, scenes, Text bubbles of different shapes and colors, or just some shapes to use in the pictures. To create stories is easy. Kids just pick the images they need into to storyboard boxes. Once the image is dropped in the box, they can edit the image by choosing different colors for different parts, rotate and resize the image. For a boy’s image, kids can choose his hair color, skin color, shirt and pants color. There are different shapes of speak bubbles for kids to add. The background setting pictures have many choices too, like different rooms in a home, different areas in a school. There are many free contents for anyone to use. If you are a paid member, you can upload your own images. When kids finish a story, they can save it to their account. You do need an account to save the stories and share stories. The account is free unless you want to buy more features. Once the story is saved, kids can view it online as slideshow, or download the story as images or Powerpoint files. They can also embed the story in their blogs or other online media. I love storytelling tools for kids, since I like storytelling activities at home. I learned so much about my kid via storytelling. In the meantime, it is a great activity for kids too. It is great for imagination, communication and articulation, as well as storytelling skills. StoyboardThat is a free with options to purchase more features, such as more stories per week, upload your own images. The free option is pretty enough for most family uses.